Double rainbows are more common than you think. In 2010, Paul Vasquez had just finished an email to a friend about his life at Yosemite National Park when his life changed forever. Right after finishing that correspondence, Vasquez looked out the window of his small home and spotted an amazing meteorological event—a double rainbow. He captured the event with his phone, complete with his cries of excitement and jubilation at witnessing such an awesome natural occurrence. Vasquez screams triumphantly while choking back tears in the same way a person would watching a concert or the final few seconds of a Super Bowl win. Vasquez stood awestruck and elated and couldn’t wait to upload the video to his YouTube channel to show, well, no one. Vasquez didn’t have many subscribers to the channel, even though he’d posted hundreds of videos chronicling his life among the ancient sequoia trees. Roughly 800 or so people saw the video before Jimmy Kimmel came across it and tweeted it out to the world. Seven years later, the video has been watched over 44 millions times. It’s made Vasquez’s phenomenon a household name and spawned songs and commercials. But who exactly is Paul Vasquez and just how rare are double rainbows? And is he always that damn excited about nature? In a 2015 CNN profile, Vasquez retold his upbringing in the barrio of East Los Angeles, where he was born. As a boy, he ventured alone throughout Los Angeles on public buses, using a free pass his bus driving father got him to keep him occupied. “I’ve always been someone who’s fearless and immensely confident,” Vasquez said in the interview. Vasquez jumped out of helicopters for two years with the Los Angeles County Fire Department. He quit that and found a job working in Yosemite in 1985 as a park concessionaire, then as a security officer, emergency medical technician, and again as a park firefighter. Vasquez jumped to the National Park Service and worked posting public signs and fixing utilities around the park. Vasquez married a Yosemite Indian and had two kids. In 1988, Vasquez bought the eight-acre piece of land he now lives and farms on for $31,000. He’s lived on Yosemite pretty much ever since. Nature’s natural color spectrum always elicits the same pattern (red, orange, yellow, green, blue, indigo, violet) when light is refracted, commonly known from the Roy G. Biv mnemonic. While a primary rainbow is visible when light is reflected once off the back of a raindrop, a secondary and usually dimmer rainbow is spotted when light is reflected twice in a more complicated pattern. The colors of the second rainbow are inverted, with blue on the outside and red moved to the inside. The second bow appears dimmer or cloudier because much more light is released from two reflections, and both bows cover a larger portion of the sky. Accuweather explains that as many as four rainbows can be seen but only if they are reflected off of the earthly objects. But it’s just a natural phenomenon that occurs with some regularity. Not that wild. Vasquez’s rainbow, however, lasted over an hour. He’s said in multiple interviews that his camera only captured about 40 percent of the color, and the rainbow was much brighter than what came out on film. The Double Rainbow changed Vasquez life in more ways than one. First, the immediate reaction. In fact, he said it was God’s eye. Speaking directly to him. A few months after the Double Rainbow sighting, Vasquez experienced an even more significant life-altering moment. The video went viral and the response was amazing. More often than not people ask Vasquez if his passionate response was drug-induced. But he cleared that once and for all in an interview with CNN. “Everybody asks me if I was high,” he says. “No, I wasn’t high.” But he did compare himself to Noah again and said the rainbow was bringing the world a greater message. “Think about it: If God wanted to give a message to humanity, would he give it to a president? No. He would give to a humble farmer in Yosemite. God is confirming that I am like Noah. That’s what’s going on in the video. In an interview in 2012, Vasquez said that his passion for film was three decades old before the infamous video. Much like many of Vasquez’s early uploads, the video remained unnoticed until a friend of Jimmy Kimmel’s sent him a link to the weepy Double Rainbow sighting. On July 3, Jimmy Kimmel posted a tweet and linked to the original video. Not long after, former ESPN sports columnist Bill Simmons retweeted Kimmel’s post. After the video went viral, Vasquez made an appearance on Jimmy Kimmel Live. The video, and Vasquez, made the rounds on websites such as Huffington Post, Fast Company, and the Chive and the videographer did countless interviews, including a CBS News piece. Of course, just like Antoine Dodson and most of the other viral video hits of that era, Double Rainbow has a Gregory Brothers remix, and it’s been played nearly 38 million times. It also made quite a dent on iTunes. It’s hard to believe a man who both dedicated his life to nature and gets so awestruck at an event as beautiful as a double rainbow would pick such a violent way to get in shape, but Vasquez once tried to lose weight by cage fighting. After his divorce in the early 2000s, and thanks to driving a truck for 10 years across the country, Vasquez gained 200 pounds. Instead of spending his days walking around Yosemite to get his weight under control, Vasquez trained to be a cage fighter. Paul “Hungry Bear” Vasquez had one professional fight in the super heavyweight division. His one official fight was against Ross Clifton, a 6-foot-8, 360 pounds beast from California. Vasquez lost via submission. On the bright side, Vasquez did lose 180 pounds during training. He never fought again. Vasquez has everything he needs on his small plot of land outside Yosemite. Planted at an altitude of 3,100 feet, Vasquez grows vegetables and cultivates over 35 different fruit trees. He chops his own firewood and raises chickens to provide eggs. Vasquez legally grows marijuana plants because he has a medical marijuana prescription for pain. He manages to do all this on only $6,000 a year. His expenses are around $500. “Bear” Vasquez continues to post amazing videos to his YouTube channel, though none have come close to the popularity of the Double Rainbow. Vasquez has over 3,000 videos on his channel and over 43K subscribers stop by to check out his daily vlogs. Vasquez posts still shots of his Yosemite National Park view to his official photography page and is active on Twitter and Facebook, where he continues to spread the message he shared with the Daily Dot last year. Now that is beautiful. He just loves them. Check them all out here. 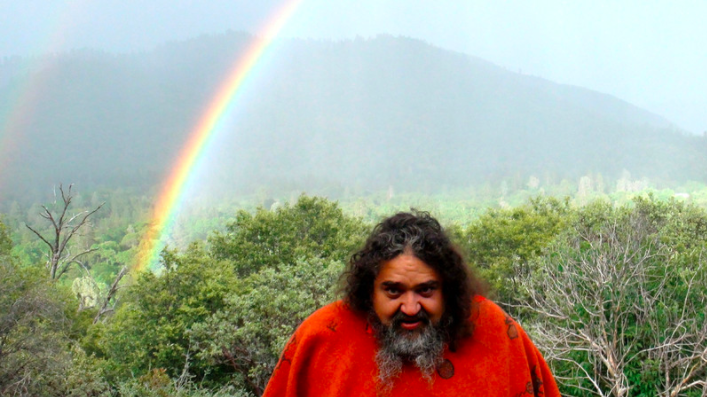 While Vasquez has turned down companies’ offers to use the Double Rainbow video in their advertising, he’s appeared in more than a few over the years. He’s in a Microsoft commercial and appeared in an in-flight safety video for Delta Airlines. Here he is promoting Windows Live. Vasquez told CNN in a 2015 interview that he’s only made $40,000 total from his online fame. He could have made twice that, but he said no to offers to put ads on his Double Rainbow video. “The video is sacred,” he said. And keeping things the way it is is the way he likes it. “My whole life hasn’t changed. I have a farm… 99% of my life hasn’t changed,” he once said. Marsibil Sæmundardóttir’s film, Double Rainbow — What Did It Mean?, was apparently half-done when the Icelandic filmmaker when she took to Kickstarter looked to raise $88,000 (Canadian) to film Vasquez at home in Yosemite. It looks like we’ll never see that other half. The campaign only raised $2,614. To promote the New Balance 890 Rainbow shoe, RunningShoes.com used Vasquez’s face and voice in an ad. The two settled out of court, and Vasquez laid out the details of the agreement in a YouTube video.